In the world we live in, with all its challenges and uncertainties, there is so much comfort in knowing we have a prophet to help us find our way! And perhaps no prophet in the history of the Church has communicated to such a wide variety of nations and media as President Gordon B. Hinckley. In his first five years as President of the Church, he delivered more than 500 discourses across the country and around the world. Discourses of President Gordon B. Hinckley, Volume 1: 1995-1999 is a landmark collection of 78 discourses from those first five years. 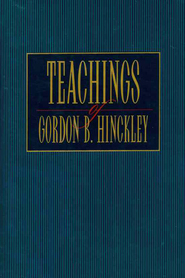 Section 1 contains all of President Hinckley's general conference addresses from 1995 to 1999, as well as all the addresses he gave at general meetings of the Relief Society and Young Women. Section 2 is a representative sample of his messages to Latter-day Saints in many nations. Section 3 shares messages delivered to the general public, including excerpts from press interviews. You will love having ready access to this wealth of prophetic counsel — and you will appreciate more than ever President Hinckley's unique skill at reaching out to people in all walks of life. Most of all, you will come to feel his strong desire to lift, to strengthen, and to provide stability in a world of shifting values. Beloved for his sound counsel, his far-reaching vision, his ease with the media, and his sense of humor, President Gordon B. Hinckley has traveled the world over, addressing huge audiences and small congregations. This volume gathers a marvelous sampling of those addresses, including all his general conference addresses from the second five years of his ministry as prophet, many additional talks selected from his travels, and speeches delivered to the general public. This landmark collection takes readers from Manhattan to Madrid, from Guam to Ghana, and also features talks from several historic satellite broadcasts, including the 175th anniversary of the restoration of the priesthood and the 125th anniversary of the Primary. Particularly poignant are the addresses given on September 11 and 14, 2001, when the United States was reeling from the attacks on the World Trade Center and the Pentagon. Truly, in such troubled times, the greatest comfort comes from knowing we are led by a prophet of God!